The nutritional information is based on the Chocolate Peanut Flavour version, when choosing an alternative flavour the nutritional values may vary. For allergens, including cereals containing gluten, see ingredients in bold. May also contain eggs, peanuts, nuts and sulphur dioxide. Salted Caramel: Oat Blend (40%) (Rolled Oats), Toasted Malted Oats (Wholegrain Oat Flakes, Palm Oil, Barley Malt Extract)), Protein Blend (16%) (Milk Protein, Whey Protein Concentrate (Milk)), Humectants (Glycerol, Maltitol), Hydrolysed Collagen, Milk Chocolate Flavoured Coating (8%) (Sweeteners (Isomalt, Sucralose), Non-Hydrogenated Palm and Palm Kernel Oil, Whey Powder (Milk), Fat Reduced Cocoa Powder, Fortified Wheat Flour (Wheat Flour, Calcium Carbonate, Iron, Niacin, Thiamin), Emulsifiers (SOJA Lecithin, E476), Natural Flavouring), Isomalto-Oligosaccharides, Nibbed Peanuts, Flavouring, Rapeseed Oil, Salt, Colour (Plain Caramel), Antioxidant (Natural Mixed Tocopherols). Warning: Excessive consumption may cause a laxative effect. Unsuitable for diabetics. Raspberry: Oat Blend (40%) (Rolled Oats, Toasted Malted Oats (Wholegrain Oat Flakes, Palm Oil, Barley Malt Extract)), Protein Blend (14%) (Milk Protein, Whey Protein Concentrate (Milk)), Humectants (Glycerol, Maltitol), White Chocolate Flavoured Coating (11%) (Sweeteners (Isomalt, Sucralose), Non-Hydrogenated Palm and Palm Kernel Oil, Whey Powder (Milk), Fortified Wheat Flour (Wheat Flour, Calcium Carbonate, Iron, Niacin, Thiamin), Emulsifier (SOJA Lecithin), Natural Flavouring), Hydrolysed Collagen, Isomalto-Oligosaccharides, Freeze Dried Raspberry Pieces, Rapeseed Oil, Flavouring, Sweetener (Sucralose), Antioxidant (Natural Mixed Tocopherols). Chocolate Peanut: Oat Blend (40%) (Rolled Oats, Toasted Malted Oats (Wholegrain Oat Flakes, Palm Oil, Barley Malt Extract)), Protein Blend (14%) (Milk Protein, Whey Protein Concentrate (Milk)), Humectants (Glycerol, Maltitol), Hydrolysed Collagen, Milk Chocolate Flavoured Coating (8%) (Sweeteners (Isomalt, Sucralose), Non-Hydrogenated Palm and Palm Kernel Oil, Whey Powder (Milk), Fat Reduced Cocoa Powder, Fortified Wheat Flour (Wheat Flour, Calcium Carbonate, Iron, Niacin, Thiamin), Emulsifiers (SOJA Lecithin, E476), Natural Flavouring), Isomalto-Oligosaccharides, Nibbed Peanuts, Fat Reduced Cocoa Powder, Flavouring (Peanut), Peanut Flour, Rapeseed Oil, Salt, Antioxidant (Natural Mixed Tocopherols). Cherry & Almond: Oat Blend (40%) (Rolled Oats, Toasted Malted Oats (Wholegrain Oat Flakes, Palm Oil, Barley Malt Extract)), Protein Blend (14%) (Milk Protein, Whey Protein Concentrate (Milk)), Humectants (Glycerol, Maltitol), Yoghurt Flavour Coating (9%) (Sweetener (Maltitol), Non-Hydrogenated Vegetable Fat (Palm Kernel Oil, Palm Oil, Shea Oil), Sweet Whey Powder (Milk), Yoghurt Powder (Milk), Emulsifier (SOJA Lecithin), Acid (Citric Acid)), Hydrolysed Collagen, Isomalto-Oligosaccharides, Nibbed Almonds (Nuts), Flavouring, Rapeseed Oil, Antioxidant (Natural Mixed Tocopherols). Chocolate Chips: Oat Blend (40%) (Rolled Oats, Toasted Malted Oats (Wholegrain Oat Flakes, Palm Oil, Barley Malt Extract)), Protein Blend (14%) (Milk Protein, Whey Protein Concentrate (Milk)), Humectants (Glycerol, Maltitol), Hydrolysed Collagen, Milk Chocolate Flavoured Coating (8%) (Sweeteners (Isomalt, Sucralose), Non-Hydrogenated Palm and Palm Kernel Oil, Whey Powder (Milk), Fat Reduced Cocoa Powder, Fortified Wheat Flour (Wheat Flour, Calcium Carbonate, Iron, Niacin, Thiamin), Emulsifiers (SOJA Lecithin, E476), Natural Flavouring), Isomalto-Oligosaccharides, Fat Reduced Cocoa Powder, Chocolate Chips with Sweetener (Sweetener (Maltitol), Cocoa Mass, Emulsifier (SOJA Lecithin), Fat Reduced Cocoa Powder, Natural Flavouring), Flavouring, Rapeseed Oil, Antioxidant (Natural Mixed Tocopherols). 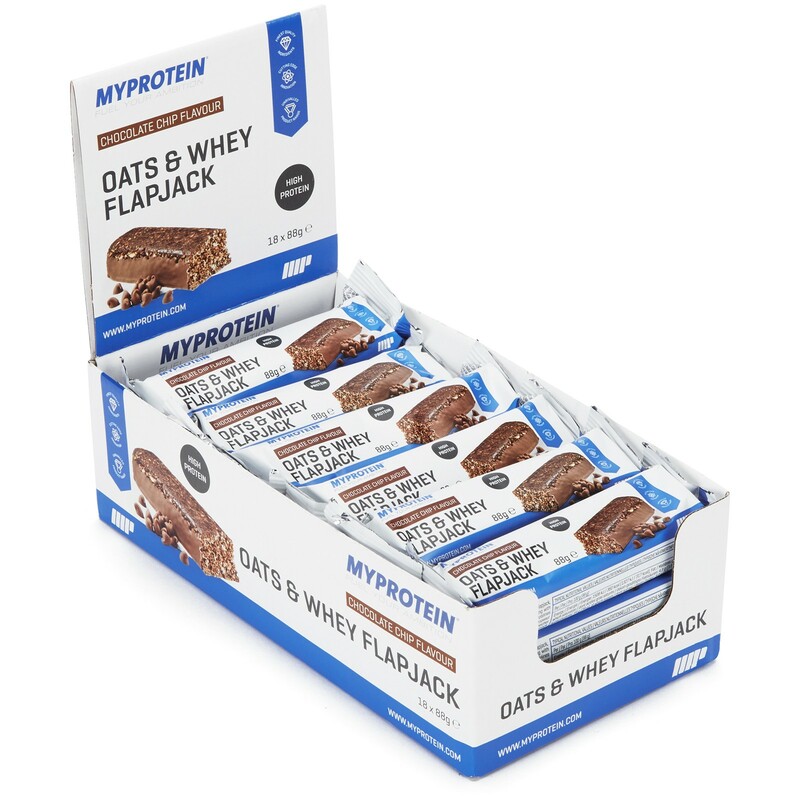 Our newly formulated Oats and Whey flapjacks are the ultimate nutritious snack for those looking to add protein and carbohydrates to their habitual diet. Each 88g bar boasts over 22g of high quality protein derived from a blend of whey protein concentrate and milk protein. The carbohydrate content is grounded from a unique Oat Blend, to offer a rounded nutritious texture and taste. On top of the improved texture from the original Oats and Whey flapjacks, we have gone that extra mile and brought 2 new mouth-watering flavours into the range which we can guarantee will fulfil your sweet tooth. Both the exclusive Cherry Almond and Salted Caramel flavours will sure do mini-wonders so make sure you experiment, experience and enjoy every mouthful. What are the key benefits of Oats and Whey? The high protein content of each 88g bar will help contribute to the growth and maintenance of muscle mass when taken alongside a structured training routine. The Oat Blend will help provide the body with a source of complex carbohydrates, and not your standard sugar based flapjacks. Each flapjack is high in fibre and low in sugar, so look no further for a superior nutritious snack. Oats and Whey provides an extremely convenient and scrumptious method of ensuring you meet your protein requirements throughout the day, complementing the nutritional needs of an active lifestyle. Who is Oats and Whey suitable for? 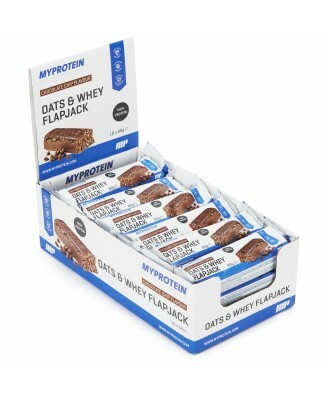 Oats and Whey bars are an excellent option for any individual from recreational gym-goers to ultra-marathon runners who are looking to increase their daily protein intake to contribute to the growth and maintenance of muscle mass. With the congested training and fixture schedules athletes are often faced with, protein is an integral part of any supplement regimen so Oats & Whey bars are a perfect solution that can easily fit into bags, pockets and even car glove compartments. Consume as a high protein snack throughout the day or in between meals (such like between breakfast and lunch or a mid-afternoon nutritious feed) to increase your daily protein intake. Warning: Excessive consumption may cause laxative effects. Unsuitable for diabetics. This product should not be used as a substitute for a varied diet. Consume as part of a balanced diet and a healthy lifestyle. Store in a cool dry place, out of direct sunlight.